So I have run a Bayesian repeated measures ANOVA followed up with post-hoc tests (actually, the comparisons are planned, but nevertheless). JASP gives me uncorrected Bayes Factors, but I'd much prefer to report corrected Bayes Factors (given the number of tests that are performed). I assume there is a way I can calculate this using the prior odds and the corrected posterior odds; I am just not sure how (by now it is evident that I'm merely a pragmatic Bayesian). I've added the output, so if someone here could just show me how to do this for one of the postdoc test, I'd be happy! Yes, this is based on the Westfall paper. If you send me an Email at EJ.Wagenmakers@gmail.com I can give you the thesis of Tim de Jong who explains how it's done. It took me a while to get back to this. I've read through the relevant parts of Tim's thesis, but it is not completely clear to me how I can calculate a corrected BF. Could you maybe explain to me how to do it for eyes moving vs. eyes fixed. Clearly, there are four different conditions in this design and it seems that the Westfall correction takes that into account. Would greatly appreciate some help! So the prior odds have been adjusted according to the Westfall formula. If you multiply this by the uncorrected "regular" BF you will get the posterior odds, which you can interpret as a "corrected" BF. just wanted to check something real quick. In the note under the post hoc table it states "note. 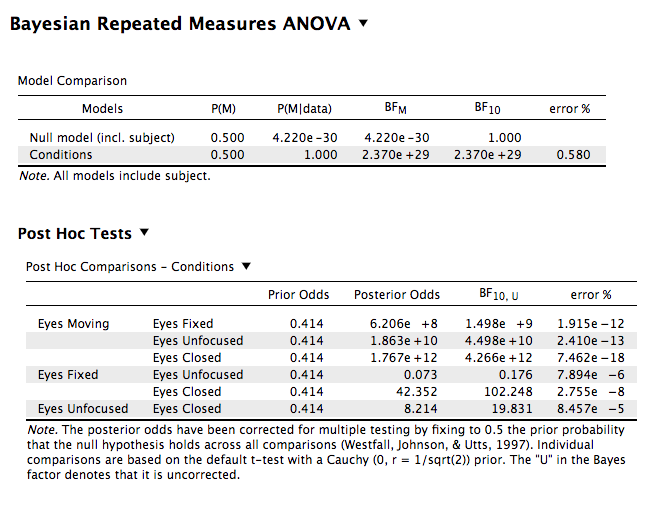 the posterior odds have been corrected for multiple testing by fixing to 0.5 the prior probability that the null hypothesis holds across all comparisons (Westfall, Johnson, & Utts, 1997)". However, I'm multiplying the prior odds by the uncorrected (regular) BF. I am not sure exactly how any correction is taken into account. Yes, the uncorrected BF needs to be multiplied by the prior odds to give the posterior odds. The correction for multiplicity is in the prior odds. Tim will do a blog post soon on his thesis, and I'll encourage him to explain in detail, with a concrete example, how the Westfall correction plays out. That would be great! Also, thanks so much for explaining!